Following a one day delay – due to a burst water main at the Kennedy Space Center (KSC) – Discovery has made her way over to the Vehicle Assembly Building (VAB), riding on top of the Orbiter Transporter System (OTS). Rollover began on time at 6:55am Eastern, departing her Orbiter Processing Facility (OPF-3) for the final time of during a flight processing flow. Discovery’s rollover on Wednesday was rescheduled after a burst water main cut off utilities to key areas of the Kennedy Space Center (KSC), resulting a constraint to the move, due to health and safety requirements – following the loss of FireEX and safety showers. “A 24 inch water main along Saturn Causeway ruptured late Tuesday evening September 7, 2010. This failure reduced water pressure throughout KSC. All water pressure was lost in some facilities in the LC-39 area. The loss of water necessitated the closure of the center to non-essential personnel,” noted a memo to engineers (L2). With KSC reopening later on Wednesday, NASA confirmed Discovery would make a second attempt to leave her OPF on Thursday morning. However, the fallout from the burst pipe will continue to be evaluated throughout this week. “Water pressure in the KSC Industrial Area (facilities south of the Assembly and Refurbishment Facility – ARF) did not drop to levels that would be a concern for possible contamination of the potable water supply. However, water pressure levels for all facilities in the LC-39 area (from and including the ARF north) during the time of the failure and repair are suspect,” added the memo. Discovery’s roll is expected to take between four and five hours in total – as arraged – in order to allow her workforce to take in several photo opportunities with the veteran orbiter, given this will be the final time Discovery will be heading to the VAB for flight processing. “OV-103 (OPF Bay 3): Roll-over of OV-103 was temporarily interrupted yesterday due to a water main break which brought down systems in many LC-39 facilities. S0004 Call-to-Stations is complete. Roll-Over First Motion is scheduled for 0630 this morning,” noted the NASA Test Director (NTD) report on Thursday (L2) – with first motion officially listed as 6:55am local. Unlike the known likelihood Atlantis would have the potential of an extra mission (STS-135) when she was rolled over for STS-132, it would be Endeavour that would gain a highly notional STS-136 mission, with Discovery retiring from service at the conclusion of STS-133 regardless. Thus, Thursday’s rollover was a highly historic event for the Space Shuttle Program (SSP). Her final flow inside OPF-3 has been relatively eventful, though still highly respectable on the IPR (Interim Problem Report) count. Discovery returned from the International Space Station (ISS) after delivering tons of cargo via the MPLM (Multi-Purpose Logistics Module) Leonardo and installing a new Ammonia Tank Assembly (ATA) on the STS-131 mission. The veteran orbiter also returned an array of down mass from the Station – including science experiments – along with an old ATA. Spotted in OPF-3, engineers were happy to see nothing more than minor dings and cosmetic damage to her Thermal Protection System (TPS). Inspections were also carried out on the ceramic inserts that line the orbiter’s windows and Payload Bay (PLB) hinge lines, in order to check for loose or liberated inserts – a small debris concern noted on previous flights. No issues were found. 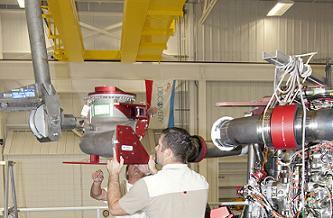 While managers realigned the mission running order, placing Discovery’s STS-133 ahead of STS-134 – due to a delay relating to Endeavour’s AMS (Alpha Magnetic Spectrometer) payload – work began on a post-STS-131 issue which required the repairing the troublesome helium isolation valve on the Right Reaction Control System (RRCS). The entire Right Hand OMS (Orbital Maneuvering System) Podwas demated for a month-long repair effort in the Hypergolic Maintenance Facility (HMF), required for access to replace the RRCS valve that had failed open during Discovery’s STS-131 pad flow. 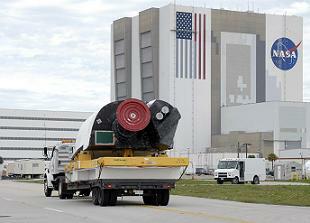 As noted during the flight rationale meetings ahead of STS-131′s launch, the option to replace the faulty valve would have resulted in rollback and demating inside the Vehicle Assembly Building (VAB), given the valve is impossible to access without the removal of the Pod from the orbiter. As predicted, the system performed without issue via the backup regulators in the system. With the Pod removed, engineers worked on replacing Discovery’s Power Reactant Storage and Distributation (PRSD) tank set 5, while conducting Orbiter Docking System (ODS) functional tests and Thermal Protection System (TPS) work around the ET doors. Over at the Johnson Space Center (JSC), the all-powerful Program Requirements Control Board (PRCB) officially approved a Change Request (CR) recommendation to increase the mission duration of the STS-133/ULF-5 mission from 8+1+2 days to 11+1+2 days. This mission duration increase followed an additional Change Request to add two previously unscheduled EVAs into the STS-133 docked timeline. Installation of Discovery’s three SSMEs for STS-133 took place in June, prior to a problem with SSME 1′s Low Pressure Oxidizer Turbo Pump (LPOTP) being discovered when it failed torque checks. All three engines had to be removed, due to their placement order hindering access to ME-1’s turbo pump – which was sent back to California for engineers to investigate its first reported issue in 13 years. With the replacement hardware added to ME-1, the engine re-installation order was changed. The PRCB-level approval to change the position for two of the engines was called for to mitigate the interference issues that caused the removal of all three engines, due to ME-1 center position. All three engines subsequently passed their torques checks at the second time of asking. 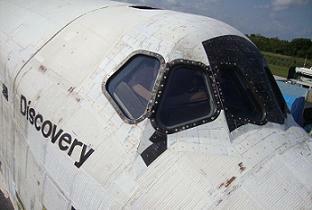 In July, Discovery welcomed back her Right OMS Pod, following its repair in the HMF. Installation of the Pod – sporting a new RRCS valve – proceeded without a hitch. 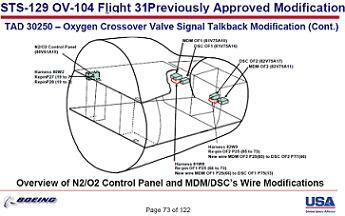 Discovery’s engineers also evaluated options for a suitable coax cable on her S-Band antenna system, following a decision to changeout the cable after the orbiter returned from STS-131. The first replacement cable failed bench tests, leading to the request for a second, third and fourth replacement. However, the cables were all classed as ‘too short’, despite being ‘in spec’. A decision was taken to use a flexible alternative, which gained additional margin for its complex rooting through the middeck of the orbiter. IPR-35 – relating to observations made during data reviews on the O2 system 1 crossover valve, which found that the Valve Position Indicator (VPI) indicated ‘on’ when it should be indicating ‘off’ – was then evaluated, with a decision to defer any repairs for one flight, effectively for the remaining operational lifetime of Discovery. Discovery’s Ku-Band troubleshooting – related to the system failing the angle rate/pitch rate portion of the self test (IPR-37) – was also closed out, following its constraint to final stowing of the Ku-Band antenna during PLBD closure for rollover. The timely closure of Discovery’s IPRs came ahead of the Orbiter Rollover/Mate Review (ORMR), which gave its approval for Discovery to depart her OPF. Upon arrival inside the VAB, Discovery will be attached to the specialized sling, prior to being lifted over to the awaiting ET/SRB stack in High Bay 3 (HB-3). Soft mate operations between the orbiter and ET-137 will then pick up, with work continuing through the weekend to the point of hard mate.